On September 7-9, 78 researchers and innovators gathered at beautiful Friday Harbor Labs on San Juan Island for the 3rd biennial ORCAS Conference. The conference focused on three themes: 1) materials synthesis and characterization for energy harvesting and storage, 2) Scaling and stability of third generation photovoltaics, and 3) Modeling grid systems that integrate conventional and alternative energy sources. Speakers explored the challenges of measuring and modeling energy conversion properties and processes from the molecular scale to the national grid scale and from timescales of nanoseconds to decades. 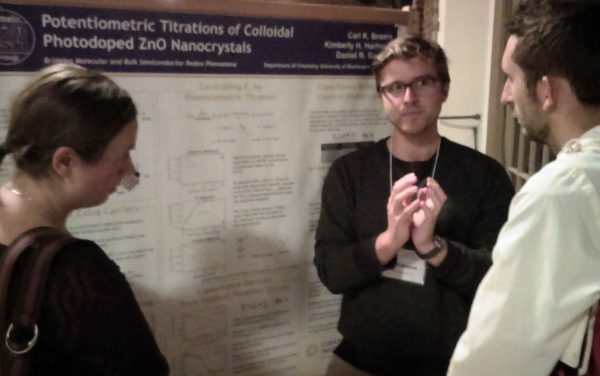 Forty graduate students from UW presented research posters with lively discussions and exchanges across disciplines.